Moving into the new house has been such a task over the last year and in more ways than just being a homeowner again. Our house was actually a flipped house where it was in horrific shape and then someone bought it cheap and fixed it up solely with the purpose of reselling it for profit. This was great when it came to the surface of appearances when we first bought it. We got a great deal, the house looked gorgeous and passed all inspections. 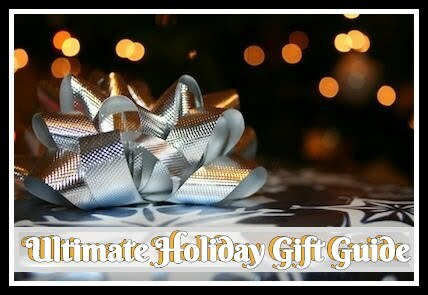 However we've discovered throughout the past year, it all came with some major pitfalls. Not only was the flipper a shady one with a bad reputation for cutting corners in our surrounding county's but he also set up certain things so they'd work throughout the buying process but not much longer. We've had multiple maintenance companies tell us the horrific stories of how he cut corners to get the house ready. Over the course of the last year, we've been working on project upon project doing everything ourselves if we can. Of course the there are big projects that require a lot of time, energy, and money. But for the littler ones I've discovered an every day tool that has helped me quite a bit since it first arrived. In fact, I've become quite obsessed with it and you will see why in my photos below. The Scrigit Scraper is a cleaning tool the same size as any average pen with different style scrapers at each end. Made of a durable hygienic plastic, it "is safe to use on most household and automotive surfaces, including Plexiglas® windows. Working on most any substance such as food, candle wax, soap build-up, paint, adhesive labels, grease and grime. After reading that it would help remove all these and more, I knew exactly how I would put it to the test. We live on a well which brings tons of rust and water stains on everything. Since we've only lived in the home for a year, we are still in the learning process when it comes to the differences in well water versus city water. 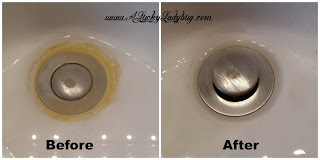 Because the home sat for a year empty, there was a horrific rust stain on the toilet in the main bathroom, rust and water stains around the tub drain, and some sort of caulk and water stain in the sink. ALL of which I had tried every chemical I could think of (even those unsafe for my septic tank) to remove these stains. I tried the ever so popular Mr. Clean Eraser, a coarse scrubby, even odd tricks like coke, and good ole elbow grease...a LOT. NOTHING worked...until I decided to use the Scrigit. Using it in combo with a Rust Remover that I had tried in the past, I was able to clean these horrid stains for the first time in a year. While I of cours we still had to use elbow grease on the toilet, the sink and tub came clean with very little effort (which you can even see in my video). Recommendation: This is my IT product for cleaning those hard to get stains and spaces. No longer will I have a dirty toothbrush or scrubby which isn't going to work nearly as well! While I can tell you I literally destroyed one of the Scrigits during my toilet cleaning, I can tell you I was not easy on it and it still could technically be used. The price is very very reasonable, I recommend this to everyone and anyone! Seriously get one or 5! 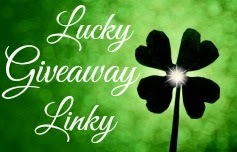 Giveaway: Scrigit is going to give one of A Lucky Ladybug's lucky readers a $20 Amazon GC plus a 2 pack and a 5 pack of the Scrigits of their own! I would clean my drains, stains off the walls and anything else it can be used for. I'd use it on our fridge. I would definitely find many uses for this. One use would be to clean labels off of glass jars that I would use for storage. The glue is hard to get off so this tool should help. I need it to clean the toilet in my hall/boys bathroom. What a great gadget. We also have well water and the drain in our tub can really use a bit of help. I also hate when you get tags and labels on items and break my nails trying to remove them. This Scrigit Scraper sounds like a very useful tool. 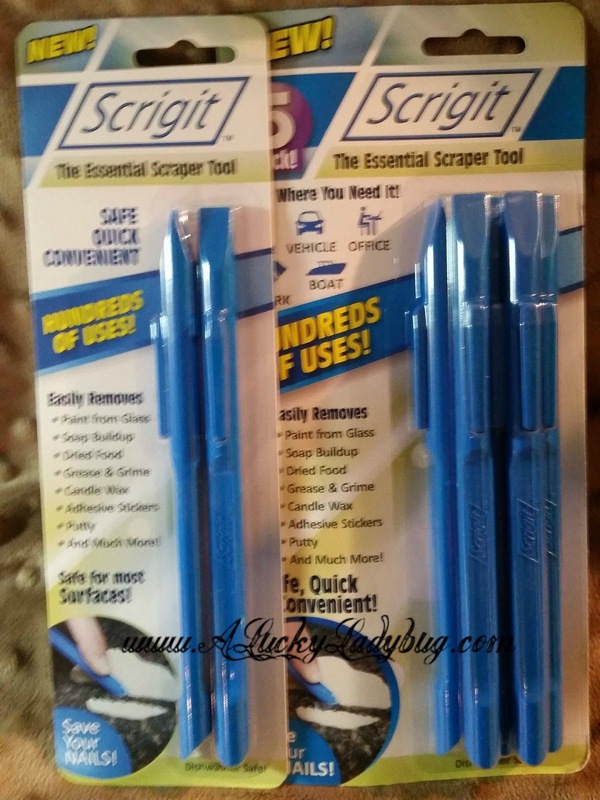 I would use the Scrigit Scraper to clean our bathroom tile floor around the baseboards. I need this tool to scrape the toilet and the sink. It would be great for cleaning my sinks and faucets. I would love to have this for the staining that's around my bathtub drain. I would like to try it for cleaning the tracks of my shower door. I bought a foreclosed home and it needs TLC. I would use this to help in my bathrooms esp the bathtub upstairs. I will put the Scrigits to work in my bathrooms-hard water and rust stains abound! I definitely have a shower that I would love to get after with this! Need it for my bathroom at the house. My sons bathroom could a good cleaning!!!! I'd clean the drain and around the base of the faucet on the bathroom sink. I would clean the drain in my kitchen sink first with the Script. I would start with the bathrooms. I'd use it to clean the bathroom. I just bought a house that is on well water and the toilet and sinks in both bathrooms can really use this. Thank you for the review. My bathroom sink needs this tool the most out of the house. I would use it to clean the hard water stains on my sink in the bathroom. 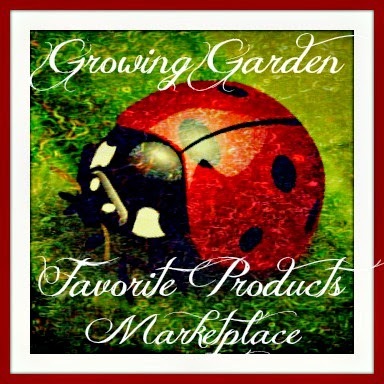 I always like this blog and I do read about useful information for myself and my family. I could use this tool to help clean up in the bathroom and kitchen. I would use it for the tub first. I need for my bathroom sink!!! I would clean my bathtub drain first. I need this tool to remove the stains around our bathtub drain. 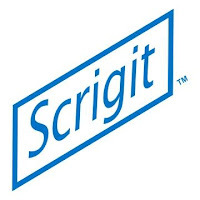 I would use the Scrigit Scraper to clean my bathroom tile floor. I'm hoping to win to use this on the sink drains. I need this tool for everything, we just got a new home so I need to keep it clean. Kitchen sink, dishwasher drain, bath tubs and even the toilet. I would use it for the toilet in the main bathroom and maybe the bathtub. I would use it for cleaning my sinks and faucets. Probably a few things also. I need this to clean paint splatter off of my windows. It would be great for cleaning my sinks and faucets in the boys bathrooms. My 4 and 6 year old love stickers but they also love putting them on my coffee table and dinner table. I would use these to take them off. I definitely need this to clean the toilet bowl. Thank You for the giveaway…would use to clean "gunk" that has collected in corners of our basement office i.e. has old linoleum tile flooring. I have the same ring in my sink so I would use it to clean it with! I need the scrigit for my toilets. I would clean those first. it would be great for the bathtub and toilet.